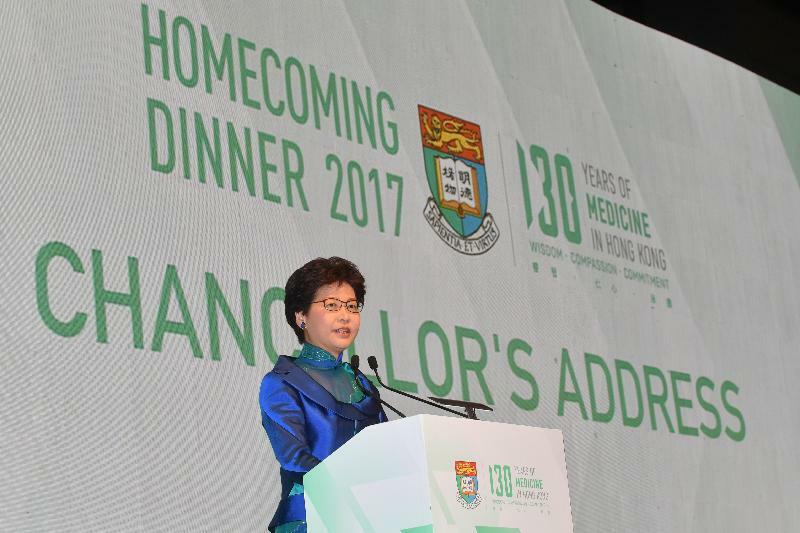 Following is the speech by the Chief Executive, Mrs Carrie Lam, at the "130 Years of Medicine in Hong Kong" Homecoming Dinner in celebration of the 130th Anniversary of the Medical Faculty of The University of Hong Kong at the Hong Kong Convention and Exhibition Centre today (December 17). David (Pro-Chancellor of University of Hong Kong (HKU), Professor David Li), Arthur (Council Chairman of HKU, Professor Arthur Li), Peter (President and Vice-Chancellor of HKU, Professor Peter Mathieson), Gabriel (Dean of the Li Ka Shing Faculty of Medicine of HKU, Professor Gabriel Leung), faculty members (past and present), ladies and gentlemen, good evening. It is an honour to join you at tonight's Homecoming Dinner, the grand finale in a year-long celebration of the University of Hong Kong's Medical Faculty on its 130th anniversary. This is indeed my third Hong Kong University faculty function in less than a month's time preceded by the 35th anniversary celebration of the Faculty of Dentistry and the 50th anniversary of my own faculty, the Social Sciences Faculty. This is what I see as a role of the Chancellor of the University - I am here to support the University. Hong Kong's first institution of higher learning, the Medical Faculty is the unshakable foundation on which Hong Kong's progressive medical and public healthcare system has been built. After 130 years of evolution, today it continues to grow and excel, and continues to safeguard the health and well-being of this community, connecting with medical and healthcare institutions here in Hong Kong and around the world – for the greater good of us all. In short, the Faculty and its many distinguished alumni, continue to make us proud. To the University of Hong Kong's Medical Faculty, I congratulate you on this momentous occasion. I am no stranger to speaking to a predominantly medical audience, having had the honour to do so several times as the Chief Secretary for Administration at events of the Hong Kong Academy of Medicine, the HKU Medical Faculty's graduation, the Digby Memorial Lecture Dinner, the Professor Arthur Li Lecture of the Chinese University's surgeons and as the CE-elect, at the Hong Kong Sanatorium and Hospital Li Shu Fan Oration. I hope on those occasions, I was speaking consistently with passion about our medical services and medical professionals but at the same time, appealing for a more open approach in working with other disciplines as well as in admitting overseas trained doctors to augment our staffing situation and promote helpful exchanges. These candid remarks will continue to be delivered tonight, despite my new capacity as the Chief Executive and Chancellor of this University, because they reflect experiences and observations from my years of public service career which were closely related to Hong Kong's healthcare services. To briefly recap, I started my career as a young Administrative Officer in what was then the Medical and Health Services Department, responsible for hospital planning. In 1991, I became a Principal Assistant Secretary in the then Health and Welfare Branch, serving as secretary to the Medical Development Advisory Committee, chaired by the very distinguished Dr C H Leong, and secretary to a high-level committee reviewing Hong Kong's primary health care, chaired by another distinguished doctor, of course both are alumni of this university, Professor Rosie Young. I know that both of them are with us tonight at this venue. In 1993, I became the Department of Health's Assistant Director. Between 1997 and 2000, I sat on the Hospital Authority (HA) Board, representing the Financial Secretary. I also served, voluntarily, as a member of the Board's Patients' Complaints Committee. I then worked closely with my medical counterparts in elderly and rehabilitation services as the Director of Social Welfare. In those and other working relationships and encounters, I came to know many devoted healthcare professionals. Their commitment, dedication and striving for excellence is something we should all be thankful for. What I appreciated in those years, and what I continue to be grateful for today, is that Hong Kong is very blessed with a high-quality, cost-effective medical and healthcare system. Over these next five years, I am determined to preserve and enhance it for the people of Hong Kong. There are no shortage of issues we must face and solve if we are to maintain our standards and our international recognition. Our population is ageing, healthcare costs are rising, our public hospitals are overloaded and our healthcare staff woefully stretched. I saw the situation myself when I visited the Queen Elizabeth Hospital during this July's summer flu, just two weeks after my taking office. Prior to that, I also heard first-hand the grievances of our front-line public doctors who are members of the Election Committee. Two months ago, I presented my first Policy Address as Chief Executive. In it, I shared my governance philosophy and addressed the policies and priorities to be tackled over the next five years. In healthcare, my Government will allocate resources to actively promote primary healthcare, enhance public health regulation and promote advancements in medical technology. I don't think there is enough time for me to go through all the measures but just let me stress that they are conceived in accordance with my belief in the provision of social services: that we should promote cross-sector and cross-profession collaboration as well as public-private partnership to make better use of our resources and provide more comprehensive care for the needy in society. I also pointed out that as public resources are not without limits, the policies and measures for improving people's livelihood are not merely a matter of supply and demand, but they also involve the issue of resource allocation which the community must not shy away from. Putting this belief in the healthcare sector, the Government is determined to step up efforts to promote individual and community involvement, enhance co-ordination among various medical and social sectors, and strengthen primary healthcare services particularly at the district-level. Through these measures, we aim to encourage the public to take precautionary measures against diseases, enhance their capability in self-care and home care, and reduce the demand for hospitalisation. A steering committee on primary healthcare development chaired by the Secretary for Food and Health was established last month to oversee our work in this area. Pending a major shift to primary healthcare, and significant advancement in cross-sector collaboration and public-private partnership, we could not afford to turn a blind eye to the overloaded situation in our public hospitals. The Government will devote more resources to enhance the infrastructure and manpower to improve the public sector supply. In particular, we will introduce a new arrangement by undertaking to increase the recurrent funding for the Hospital Authority progressively on a triennium basis, having regard to population growth rates and demographic changes. On manpower, the HA will fulfil my pledge to employ all qualified medical graduates and provide them with relevant specialist training. The HA will make every effort to retain existing and rehire retired healthcare professionals as appropriate. It will also proactively recruit qualified non-locally trained doctors through limited registration to provide clinical services in the public healthcare system. My Government is thus committed to developing innovative biomedical technology. We'll do it by turning Hong Kong into a centre of innovation and technology . And we've made a good start at that, laying down a solid foundation. The Hong Kong Science Park is home to about 100 international and local biomedical technology companies. That's nearly double the number in 2015. From overseas, the Ming Wai Lau Centre for Reparative Medicine, the first offshore research facility of Sweden's renowned Karolinska Institutet, is now into its second year in the Science Park. Karolinska is focused on research in stem-cell biology, biomedical engineering, biotechnology and regenerative medicine. From the Mainland of China, the Chinese Academy of Sciences' Guangzhou Institute of Biomedicine and Health has set up the Guangzhou-Hong Kong Stem Cell and Regenerative Medicine Research Centre at Science Park. And among the 16 Partner State Key Laboratories established in Hong Kong universities, nearly two-thirds specialise in biomedical technology and related areas. Human trials conducted at our two teaching hospitals – Queen Mary and Prince of Wales – and the Hong Kong Eye Hospital can be used to support new drug applications to the China Food and Drug Administration. That, ladies and gentlemen, gives Hong Kong a singular advantage in the research and development of biomedical technology. I am glad to note that, at the end of July, 430 applied R&D projects, with total funding of about HK$832 million, were approved by our Innovation and Technology Fund. They will support research ranging from molecular diagnostics and drug discovery and development, to medical devices, the modernisation of traditional Chinese medicine and bio-pharmaceutical manufacturing. In short, we're fully engaged, because I believe this is our moment – Hong Kong's time to tap into the vast promise of biomedical technology. If we succeed, it will not only help raise the healthcare standard in Hong Kong. It will also help us develop related industries and contribute to the human kind. There will be a lot of opportunities in front of us, especially in the context of the Guangdong-Hong Kong-Macao Bay Area development – the most affluent region in the Mainland today where a growing middle-class population will have huge demands for quality medical services. I look forward to joining hands with our medical institutions and professionals in grasping these opportunities. With the above remarks, I wish the University of Hong Kong's Medical Faculty continuing success. For everyone here, I wish you all an enjoyable and memorable evening, all happy holidays and a year rife with rewarding discovery. 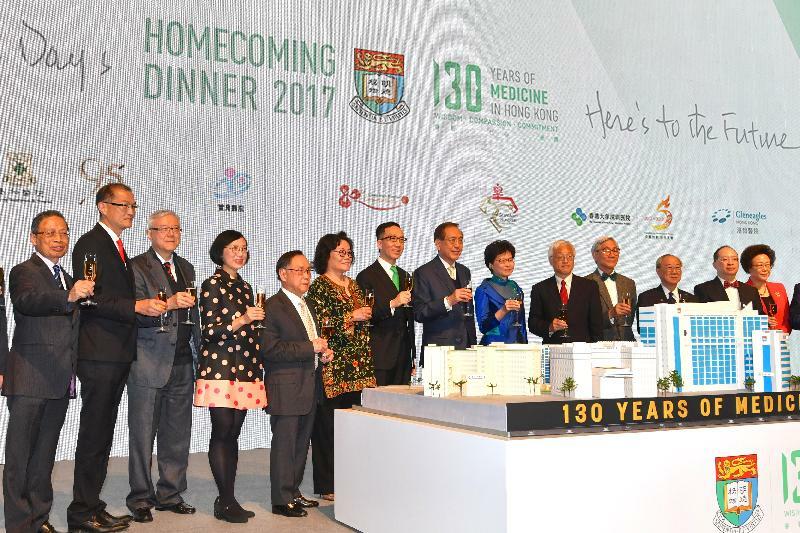 CE attends Homecoming Dinner in celebration of "130 Years of Medicine in Hong Kong"